Tell us about yourself. 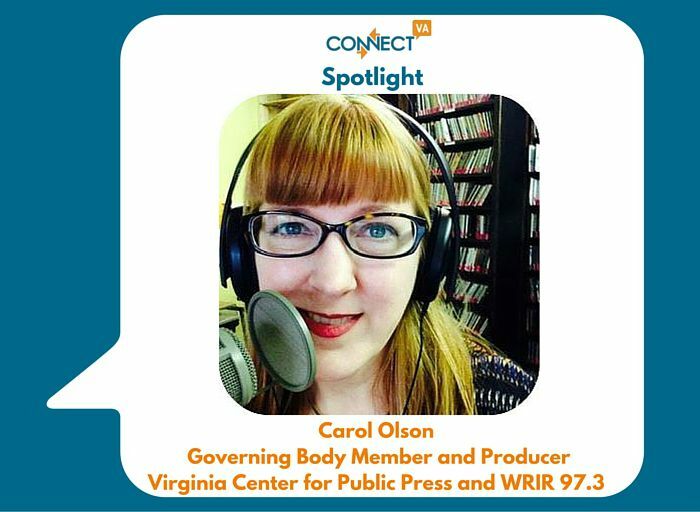 I am Carol Olson, governing body member of the Virginia Center for Public Press and Co-Chair of the News and Public Affairs Committee and a talk show host and producer at our radio station: WRIR 97.3 LP FM Richmond Independent Radio. I joined the station about a year and a half ago, first as a producer in a short module. What is the focus of your work? The station was created 10 years ago to offer a venue to give a voice to under-represented news and music from the local arena in Richmond. We are a mix of local musicians who DJ music shows representing a range of genres, and local advocates and activists who host and produce a range of news and opinion shows representing a range of ideas, issues and solutions current in our community. What do you find most rewarding about your work? I get to bring a diverse group of people from the community I love and live in to the airways. I get to develop, nurture, listen to and participate in great conversations about the really important things our community is dealing with. I get to be exposed to innovative ideas and solutions that individuals and nonprofits are out there making happen everyday. What are some major challenges you have faced? We are an all volunteer endeavor. Our challenges are capacity to train people the skills needed to produce their shows. It can be complicated and daunting to learn radio production, and takes time but is very rewarding! We are working now to improve our ability to train people and move people from proposing their great ideas to becoming radio talk show hosts. What’s coming next for you and/or for your organization that really excites you? I am excited to expand the footprint of local voices on the airwaves. I am seeking dedicated people with a passion to talk about politics, sports, social concerns, activism, and current issues to the radio. At 10 years into this venture, we are ready for more people to join us. How are you leveraging ConnectVA to achieve your mission? ConnectVA gives us a venue to outreach to people- volunteers, future radio stars, and people with a beat in their heart ready to play it on air to join us. Anything else you would like to share? Low power independent radio is designed for the community to talk to one another, spread awareness about what’s happening with social concerns, artistic projects and emerging local music.